If your firm is continually struggling it might be time to take a good hard look at what is perhaps the greatest root of all problems of fledgling business endeavours – the leader. You might be the biggest anchor holding your firm back from success. 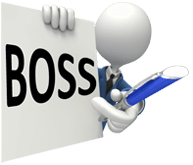 Like any business, accounting firms need not just an owner but a leader at the helm. How do you know if you fit that definition? Ask yourself this question – are you guiding the firm with the sense of accomplishing goals (going after what you want) or do you see yourself as only fending off one problem after another? There’s a difference between these two paradigms. The first view revolves around building what you want. The second viewpoint however is really just a never-ending holding action – it might keep you where you are, but it doesn’t allow for growth. If you want to follow that first paradigm you have to ask yourself an even more fundamental question – do you know what you want? When you set up your firm you set in motion a machine that has a single purpose in mind – to get you what you want. If you can’t define that desire to yourself, how are you going to inspire employees to help you achieve your goals? This extends to your customers as well. Why should customers choose your firm over the competition? For example, if a lower price is all you have to offer then A) you’re going to have to turn into a grist-mill and you’ll spend more time keeping up with the workload instead of building towards your goals and B) you won’t be inspiring your customer base with the notion that you’re the firm they should team up with. As soon as your customers can afford a firm they feel more confidence in, they’re going to jump ship. Such manipulations as having the lowest price, a sale, giving away a puppy for a limited time, what have you – they do work… for the moment. But they don’t breed long-term customer loyalty, and they certainly don’t inspire employees to believe in you or your business. There are some companies that have an almost fanatical and long-term following in both their employees and their customer base – Apple, the U.S.’s Southwest Airlines, the Virgin umbrella of businesses; you can certainly come up with some more examples. Think about Apple – people will line up overnight to buy a new phone. The latest version of these phones are rarely a huge leap forwards in technology, and they’re astoundingly overpriced, but people still clamour for them. Some few will even turn hostile if you challenge their purchasing decisions. It’s time for some more questions and answers. Marketing consultant and best-selling author Simon Sinek wants you to ask yourself these three questions. The first question has an obvious answer – what does your business do? The answer – you provide accounting services. Any firm will answer the same way. The second question is where you start to differentiate yourself from other firms – how do you do what you do? Now you’re talking about your specific workflow, the way you’ve learned to best interact with your clients, using outsourcing, etc. The third question is the most important and it’s one that surprisingly few can answer (in a way that will inspire customers and employees) – why do you do what you do? This last question is really what separates leaders from mere owners. The answer to your why should not be “to pay the bills.” You can do that working for someone else minus all the stress of running your own business. If “money” is your answer, then you’re wasting your time starting your own firm. And nobody is going to buy services based on advertising that smacks of “give me your money”. Instead, your why must be personal. Your why must be an extension of you. What is the accounting industry doing wrong? What angered you in terms of the way a certain kind of client was treated? Were you cool with the obfuscation of big firms who made it a practice of keeping data from clients until they (the firm) felt comfortable releasing it on their terms? Is there a niche of clients that have been sorely underrepresented? What do you passionately believe needs to be changed for the better in the accounting industry as a whole? That is your why. Your why is going to be your draw. If you’re getting frustrated on behalf of a certain section of the accounting client base, you can bet that the client base in question is also frustrated. They’re desperate for someone in the accounting field to stand up for them. If you’re the one who stands up and makes their cause your why then you are automatically going to have a loyal customer following. The money we mentioned at the top of this section will be the result. You will be to them what Apple is to those people who line up to buy phones. And you will have given your employees a reason to not only work for you, but to fight on your behalf if needs be. This isn’t an ephemeral mental exercise by the way. Take a couple of minutes right now and see if you can write out in a clear and concise sentence or two why you went through all the trouble, stress, time, and money to create your firm. With the core question of why answered, you can now make up actionable workflows. Working backwards in the questions, we return to how. Your how will be shaped by your why – the way you provide your services will grow from the reason your firm exists at all. For example, if your firm exists to make sure that clients never have to worry about accessing their data then you and your team will constantly be trying to find ways to enable a client’s inclusion in the process. When they choose your services over your competition, they won’t just be making a business decision, they’ll be making a statement. They’ll be telling the rest of the accounting world that the old way of obfuscation will no longer be tolerated… and they’ll do this by becoming your loyal client. Leadership stems from having a heartfelt reason why you’re building a business. Everything else – your workflows, your marketing, your social media interactions, the way you make it up to a client if you make a mistake, your branding, your employees’ loyalty and contributions – will naturally grow from this paradigm that you’re introducing into the accounting field.